How is Machine Learning revolutionizing mobile technology? If there was one challenge for companies in recent years, it would definitely be digital transformation. Increasingly more businesses are choosing to implement new, innovative technologies into their company. 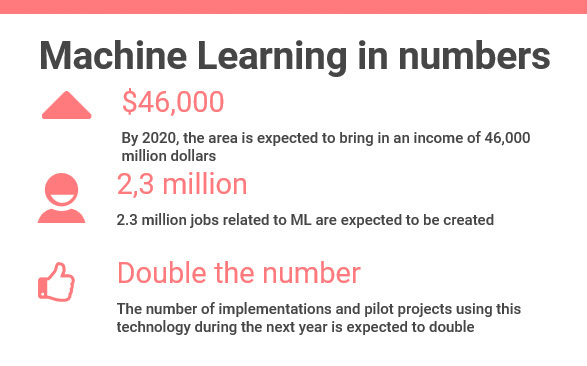 Undoubtedly, one of the most popular among these technologies, is Machine Learning. Automatic learning is a branch of Artificial Intelligence that includes the learning and development of a machine as the user continues to use it, with the main objective of offering a better service and more effective results. It is based on the mass analysis of large amounts of data in order to locate recurring behaviour patterns and ability to anticipate human actions. One of the areas which has benefited most from machine learning is that of mobile applications. Considering most people spend twenty-four hours a day with their mobile phone, it’s rare to see someone without theirs at hand, it’s not surprising that 63% of last years total traffic was through these devices. Although we often don’t realise, most apps we use in our day to day lives are equipped with Machine Learning. These include some large companies, like Amazon who knows what products to recommend, Netflix who knows what kind of series might interest you, and Facebook who recognises your friends faces. This is where the real magic happens; platforms that are one step ahead of our actions and offer an optimized and unbeatable user experience. Most innovative services offered by mobile technology are based on Machine Learning. Facilities like unlocking your screen with your fingerprint or your face have become something normal, but it was only a few years ago this was something impossible. Now, it’s a reality! This is where the true effectiveness of Machine Learning lies: inference. A mobile device equipped with automatic learning inference doesn’t require an internet connection and has a heightened, agile response. Since the model is transferred to the data, and not the data to the model itself, it avoids having to continually require consultations. It can offer unbelievable services, that we would only imagine to see in science fiction movies. Taking into account that the infusion of mobile phones in developed countries is expected to exceed 90% by 2023, Machine Learning in mobile technology still has a long way to go. A large number of “invisible innovations” are expected to reach the market, that will help facilitate their use, such as the recognition of users locations based on depth maps for example. Mobile technologies continue to grow and evolve…so watch this space!